Video utility now supports Wi-Fi sync and can create ringtones. A year and a half later, Softorino YouTube Converter looks positively quaint compared to the powerhouse sequel, which dramatically improves upon the original in every way. It’s not perfect—and no longer free like the original was—but the convenience more than makes up for the cost. Like to watch 4K videos on your iPhone 7? Softorino YouTube Converter 2 now supports those huge downloads, as well as VR 360 and high frame rate videos. The first Softorino YouTube Converter 2 ($20) improvement is wireless connectivity. Like Softorino’s equally handy Waltr 2, YouTube Converter 2 now recognizes iOS devices set up in iTunes for Wi-Fi sync, which appear as a transfer destination without being tethered to your Mac or PC. Wi-Fi worked for me straight away, but you’ll want to double-check the preference setting for enabling wireless connectivity; there’s also a short tutorial video that walks users through this process. You can still connect using Lighting or 30-pin cables; YouTube Converter 2 is compatible with all Apple devices dating back to the original iPod in 2001, and in my tests, transfers were equally fast wireless or wired. Speaking of speed, the entire application boasts a 4x improvement over the original, which was already quite peppy to begin with. This is mostly noticeable when downloading larger 4K Ultra HD videos, and YouTube Converter 2 now supports VR 360 and high frame rate videos up to 60fps as well. 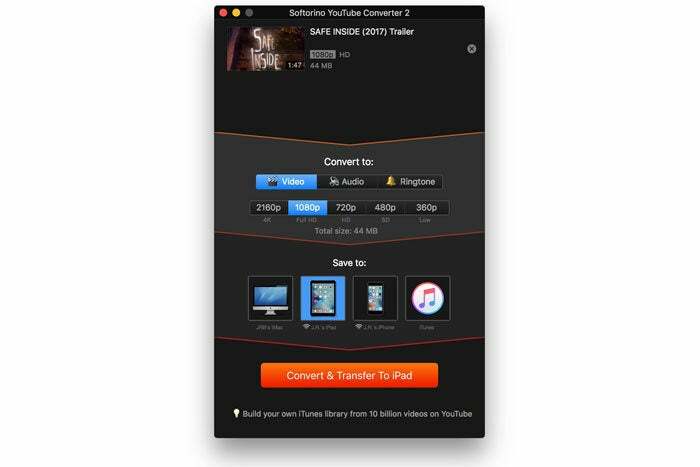 Softorino YouTube Converter 2 adds the ability to search for YouTube videos without leaving the app, but you’ll have to copy a URL for the other 52 supported websites. Despite the name, YouTube Converter 2 is not limited to downloading YouTube videos. At present the utility works with 53 different websites just by copying a URL, which is automatically picked up by the software and ready to download in one click. The list includes Funny or Die, Discovery (including sister sites like Animal Planet), Bandcamp, SoundCloud, and more. YouTube Converter 2 includes one major improvement for downloading funny cat videos and the like from Google’s service, however. In-app search makes it easy to find whatever you’re looking for without a web browser. Just type in the search field, and a panel appears at left with your results. Select a video, and you can quickly queue it for download to your Mac, iOS device, or directly to iTunes without invoking the Command-C copy shortcut. It would be nice if this worked with other supported websites as well, but frequent YouTube downloaders will definitely appreciate the bump in convenience. Speaking of handy, YouTube Converter 2 now converts downloads to ringtones as well as video or audio files. You have the option of saving the entire song or only the first 30 seconds, but sadly there’s no way to trim a specific section. It’s worth noting that transferred ringtones are lost when syncing via iTunes, so you’ll want to save audio and add them to your Mac or PC library as Tones in that case. One-click ringtones are convenient, but you can’t trim the selection and files are lost when syncing Tones with iTunes. YouTube Converter 2 addresses a few shortcomings of the original. You can now double-click the title to customize the file name prior to conversion, grab an entire playlist at once, and automatically include subtitles. But other limitations remain, such as sparse or non-existent metadata, often poorly-cropped music artwork, and the fact YouTube Converter 2 can only add videos to the Home Movies section of the TV app. Technical limitations aside, Softorino YouTube Converter 2 is the most convenient way to download website videos to iOS devices.